Students in the Internship and Study Abroad Program kayak in Sydney. The past month has been an exciting one as we’ve settled into Sydney and started to explore our new home for the next few months. The city is vibrant and dynamic, with something for everyone and with so much to see and learn about I wonder how we’ll fit it all into the next three months. Perhaps the neatest thing about Sydney is its seamless blending of a highly developed urban center and vast expanses of protected coastal land to hike and explore. For the outdoorsy and adventurous, you don’t have to travel far before finding yourself in the middle of the Blue Mountains. On our first weekend in Sydney, we traveled out to the small town of Katoomba to see the Three Sisters, an ancient rock formation where we were met by an indigenous ranger who educated us about Aboriginal culture. He showed us a variety of authentic artifacts including a boomerang and a didgeridoo, a type of Aboriginal instrument. Our adventure to the Blue Mountains also included a trip to the Featherdale Wildlife Park to get a close-up view of some of Australia’s most iconic critters including kangaroos, koalas, and crocodiles. everyone was able to successfully catch a wave. 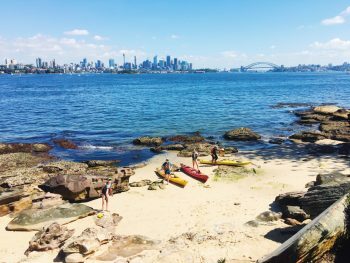 The next day, a few of us enjoyed an afternoon kayaking around Rose Bay. After a week of torrential rain, the clouds parted and made way for one of the prettiest days we’ve seen in Sydney since we arrived. The bay afforded an awesome view of the Harbor Bridge and the Opera House but the highlight was seeing little penguins swimming around our kayaks. Rich with culture and history, Sydney is home to a large number of interesting museums and cultural attractions and a rainy Saturday afternoon seemed as good a day as any to get a quick lesson on the history of Australia. Our first stop was the Hyde Park Barracks Museum to learn a bit more about Australia’s first settlers followed by the Museum of Contemporary Art. Later that week, after meandering around the picturesque Circular Quay, we made our way to the Sydney Opera House to enjoy a performance of La Bohème. The unique architecture of the Opera House is unmistakably Sydney and the view across the harbor at sunset was stunning. Charlotte Braverman ’18 surfing in Sydney. In addition to all of the fun we’ve been having outside of the classroom, we’ve also gotten acclimated to Sydney student life which contrasts quite starkly with that at W&L. The big urban campus really couldn’t be more different from the pastoral rolling hills and classic red brick buildings in Lex and the bigger class sizes have definitely been a change. Fortunately, the University places a high emphasis on learning to work effectively in teams which offers a great way to get to know other USyd students. Claiming over 53,000 students, the University of Sydney is big and diverse with students from all over the world. Through peer groups in my Marketing and Organizational Behavior classes, I have had the opportunity to work with students from China, Japan, England and Australia and it has been especially neat to hear the international viewpoints many fellow students bring to class discussion in our smaller tutorials. I’ve found the presence of such a broad range of perspectives greatly enriches the learning process especially in my courses that explore business within the context of an increasingly global economy. With midterms approaching, we’re buckling down and studying for exams but still remembering to take advantage of all of the cool things to do in Sydney. Tonight we’re off to a Socceroos match, Australia’s national soccer team and this weekend Amanda and Caroline depart for a camping trip in the Outback so stay tuned for more adventures!